My pal Beth Cato has a new book coming out soon, and to help get the word out she’s visiting various blogs around the place to talk about it. And, she’s also sharing her awesome recipes to boot. As a bread and beer maker myself, I couldn’t resist the allure of beer bread. But first, the steampunk! Hi! I’m Beth Cato. I’m here to share in the joy of buttery baked goods and to introduce you to my book. Orphaned as a child, Octavia Leander was doomed to grow up on the streets until Miss Percival saved her and taught her to become a medician. Gifted with incredible powers, the young healer is about to embark on her first mission, visiting suffering cities in the far reaches of the war-scarred realm. But the airship on which she is traveling is plagued by a series of strange and disturbing occurrences, including murder, and Octavia herself is threatened. Suddenly, she is caught up in a flurry of intrigue: the dashingly attractive steward may be one of the infamous Clockwork Daggers—the Queen’s spies and assassins—and her cabin-mate harbors disturbing secrets. But the danger is only beginning, for Octavia discovers that the deadly conspiracy aboard the airship may reach the crown itself. You can also read the full first chapter over at Tor.com. It can be found or preordered at Goodreads, Amazon, Barnes & Noble, and most any independent bookstore. Now, on to the beer bread! I’m an author, but I’m also somewhat infamous for my baking. Every Wednesday over at my site, I post a new recipe in my Bready or Not series. This beer bread is one of my personal favorites. It’s great to bake during a deadline crunch because the mini loaves make it easy to use one for a meal and then I can wrap up and freeze the others for later. 1) Preheat the oven to 375-degrees. Prepare your big loaf pan or mini loaf pans by buttering lightly on the bottom (the sides will be well-buttered later on). 2) Sift together flour, salt, baking powder, and sugar. Stir in the beer. It may be sticky and need to be incorporated by greased hands. 3) Drop the dough into your pan(s) and even out the top as much as possible. Melt the stick of butter and pour it all over the dough. 4) Using four mini loaf pans, it will bake for 30-35 minutes. The original recipe stated that a full-size bread pan needs to bake for an hour. Let it cool in the pan for about five minutes, and then because of all the butter, the bread should pop right out. 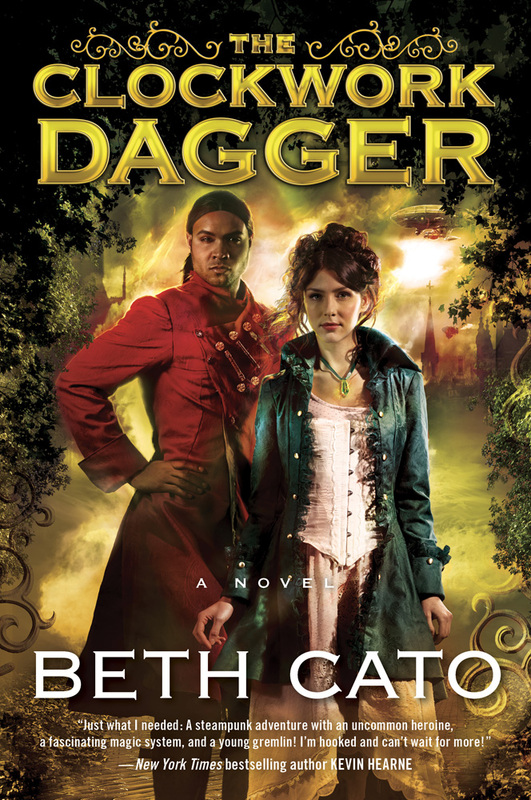 Beth Cato’s the author of THE CLOCKWORK DAGGER, a steampunk fantasy novel from Harper Voyager. Her short fiction is in InterGalactic Medicine Show, Beneath Ceaseless Skies, and Daily Science Fiction. She’s a Hanford, California native transplanted to the Arizona desert, where she lives with her husband, son, and requisite cat.